Partly cloudy and warm, Water temperatures 38* up lake and mud, 40* mid lake and 51 at the Dam. Today was my first day back on the water in awhile. It's hard to go fishing with the weather we have been having, but we got out today. The ice up lake finally melted yesterday but it still was very cold at the 208 bridge, 40*. Today Alan and I got out early and caught 175 baits to fish with. We picked up the rest of my clients at 6:45 and went in search of Stripers. Since the water temperature had dropped 6* in less than a week I decided to work downlines in the morning then convert over to boards once the water warmed up a little. We set up first in an area where fish migrate back and forth between shallow and deep water hoping to catch fish changing patterns since the weather was to change 30 degrees today. We set up putting out just 8 baits to show the guys what I do and my main man Bobby hooked up first. We worked an area of 150 yards in a transition area for awhile before we made a move. Bobby had the hot hand today, he kept busy most of the morning. I located 4 or 5 different areas where I found fish on my Simrad catching fish after fish. Dave and Bobby are holding up two of the better Stripers we caught this morning. Today started off right with one of the guys saying a prayer which really helped. 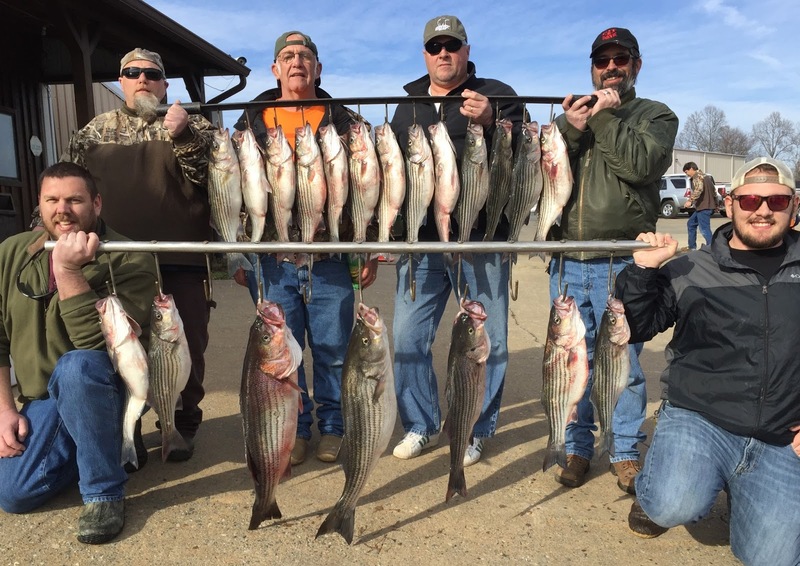 We were fishing a full moon, very cold water temps and high winds today which usually translates into poor fishing but with a little help from above we caught over 40 Stripers and 6 Largemouths today. My job is great... I get to "work" doing what I love to do, meet great people and establish long lasting relationships, have fun in the outdoors and get paid for what I do. I also have a wonderful family that supports me in my endeavors and helps me do what I do. You are truly blessed Jim, in so many ways. Stay warm and fishing my friend! Thanks Karl, don't I know it! It's refreshing to see those fat healthy stripers. I have to wonder if 3 months ago these same fish were hiding and healthy or skinny and sick looking. Hmmmm.